Quick question. Who played Dracula? Your answer might depend on a lot of thing from when you first saw Dracula in a movie to your age to what your cultural background is. I also bet that the choice of actor might also say something about your gaming choices, but I am not getting into that today. Like Dracula, who keeps coming back from the grave to scare or charm a new generation, Strahd the Vampire and his home in Ravenloft keep coming back for each version of the D&D game. You can easily buy a Ravenloft product to fit any version of D&D you like. There have been subtle changes with each round of designers and editors. To extend the Dracula movie metaphor more, I6 Ravenloft is "Hammer Horror" (Christopher Lee). 2e Ravenloft Domains of Dread (boxed sets and books) were "Bram Stoker's Dracula" (Gary Oldman). 3rd Edition was split between Wizards own Expedition to Castle Ravenloft ("Dracula 2000," Gerard Butler) and the Ravenloft setting from White Wolf/Arthaus (Lestat movies). 4e's board game, Undead books and Shadowfell books were different enough that these are more like the NBC TV series Dracula (Jonathan Rhys Meyers). This new book is "Dracula Untold" (Luke Evans). I have converted Strahd to a couple of different systems myself. I have been playing in Ravenloft, the castle and the land, since the original module came out in 1983. I played it when it first came out and it is one of maybe three adventures I have run under every version of D&D I have ever played. Ravenloft has history both in game and in the real world. It was my world of choice in the AD&D 2e years and the effect it has had on adventure design can't be overstated. To call it a sea change is not hyperbole. So the new 5e Ravenloft has a lot to live up too. I mentioned here back in the Summer that I was going to run the original I6 Ravenloft adventure for my family at Gen Con 2015. I spent most of July prepping for that, working out Strahd's 5e stats, converting the major magic items, filling in some details. None of it was hard work really. Again I *know* this adventure like few others. The hardest part was balancing out what has become the de rigueur method of handling a D&D 5 encounter with the more plot-driven nature of the Ravenloft adventure. Having this new Curse of Strahd book then would have helped me out a lot. The new book is a retelling of the same I6 Ravenloft adventure from 1983. On the down side there is not much about the "Demi-Plane of Dread" as we knew it back in 2e. This is more 4e Shadowfell. Including it as part of the Shadowfell actually gives the DM more flexibility to be honest. So that is good. I did not notice much from the disappointing 3e Expedition to Castle Ravenloft here. So that is also a plus. The book itself is hardcover, full color, 256 pages. Suitable for levels 1 to 10 for D&D 5. The "Castle Ravenloft" adventure itself has been upgraded to level 9. The first 90 pages or so are some introductions, some background and the updates Castle Ravenloft adventure. There is an introduction and forward here too. The subtle snark directed at the likes of Twilight in Tracy Hickman's forward can't be missed. There is a page on how to run a horror-themed game. It's nice, but nothing new and by no means complete. If you really want to run a horror game find a copy of +Kenneth Hite's "Nightmares of Mine" or Spooky: The Definitive Guide To Horror Gaming. The book is basically a sandbox, with Castle Ravenloft (the place and the adventure) in the "middle". It is designed for adventurers from 1st to 10th level. There are a few really interesting "side treks" including the low level "Death House", the medium level "Argynostholt" and the high level "The Amber Temple". Death House is available for free from WotC. So I would grab that first if you are on the fence about this. One of the new "features" of this book is the idea that not everyone in Barovia has a soul. Now if you were playing this as a horror game then this would be a truly frightening concept. The scenarios that are implicit in this are numerous. 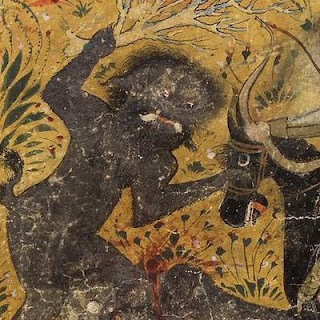 Hapless villagers moving through their lives in drudgery, unfeeling save for a pervasive dread. Or worse yet the same said villagers coming to the PCs begging them to find their lost souls. Or PCs born in Barovia discovering they are among the "Soulless Shells". Sadly though as a D&D game I see this only working as an excuse for PCs to murder bystanders. There are some interesting character options, like the new Haunted One character background. The iconic magic items like the Sunsword and the Holy Symbol of Ravenkind are here too. As well as the Tome of Strahd. The Gothic Trinkets are a really nice touch to be honest. There are some new monsters too. The is a fantastic full color tear out map of Castle Ravenloft (roughly 32" by 24") on one side and Barovia on the next. I think in the end I was hoping for more. 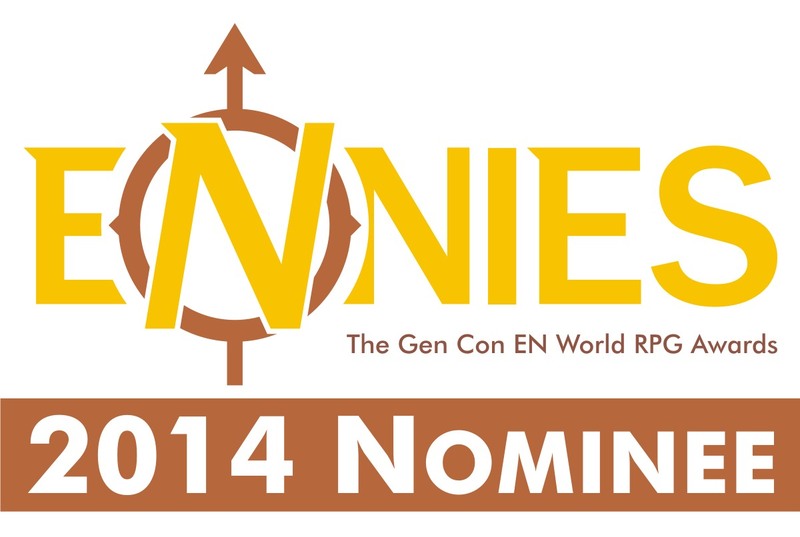 Maybe not so much as a repeat of the 2e Ravenloft Domains of Dread campaign world, but something...more. There will be a Tarokka deck you can buy later. I think I still have my 2e one around somewhere, but I prefer to use Tarot cards myself. I got excited when I saw that "Barovian Witch" listed under NPCs and had hoped to see an update to the 2nd Ed "Witches of Hala" but sadly this was not the case. But it has given me some ideas. I know. This is Pathfinder, but this is what a witch in Ravenloft could look like. Ok bottom line time. Who should buy this and who should avoid it? 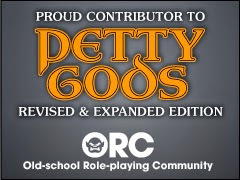 You are a fan of Ravenloft and want to have a complete collection. You are a fan D&D 5e and want to have a complete collection. A fan of adventure design and want to see how a 1st ed to 5th ed conversion can be done. If you are planning to ever run Ravenloft under 5e. Like the idea of playing in the Barovian sandbox. This is actually a big one to be honest. You are not planning on running the classic Ravenloft adventure. You are not playing D&D 5e. Want to do your own conversion of one of the many options out there for taking on Strahd in his castle. There are no new classes or races. Not even rules for playing a Vistani. There are no new spells or rituals either. This seems like a bigger miss to me. In the end you have to decide for yourself. I am certainly not someone that needs tips on playing horror game, nor am I going to run Ravenloft (the adventure) under 5e (already did it) and don't need help converting. There isn't anything here I could not have done on my or haven;t already done on my own. But I got it anyway. Hopefully there will be a sequel for levels 11-20. Just like Dracula, Strahd can (and will) come back. There are even details in the book about how it happens. So maybe a sequel is already in the works? Nice review! Now I want it even more. And I heartily second the recommendation of "Nightmares of Mine." I found a used copy ages ago, and try to reread it every few years. A good overview. 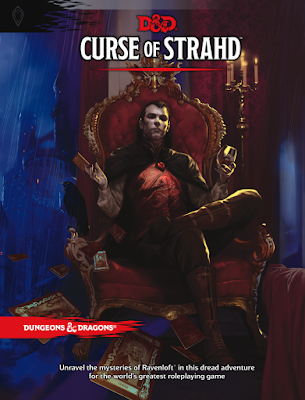 I am in a rare and fortunate spot: I have owned and read but never run prior iterations of this module, so as I prepare Curse of Strahd it will be my first time actually running it (ironically not the first time I've used Strahd or Barovia in a game, just the first time in a published module). 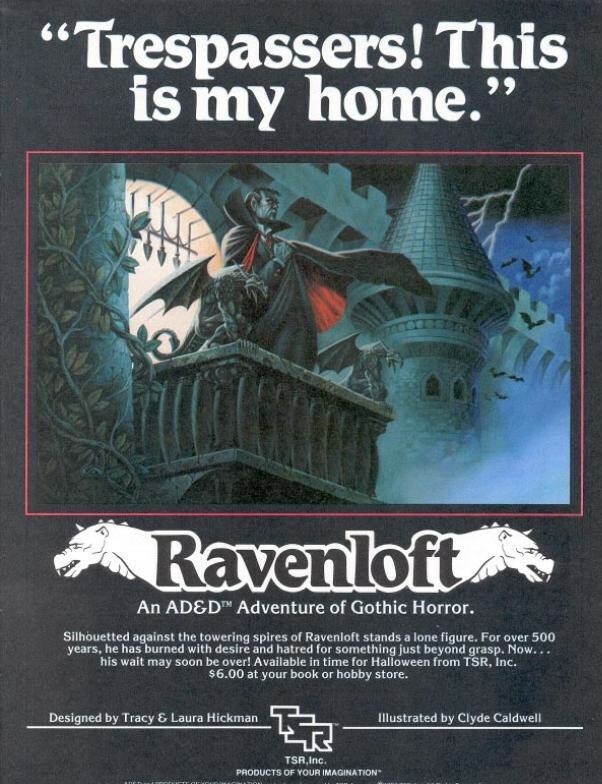 And even better, none of my players in my current groups have ever been to Ravenloft as a setting at all, so it works well for everyone in my corner of the gamingverse. I do wish the CoS had included a 30 page mini-gazetteer of the Domains of Dread, though. Maybe a future tome will fill that out (so hard to say with today's WotC).